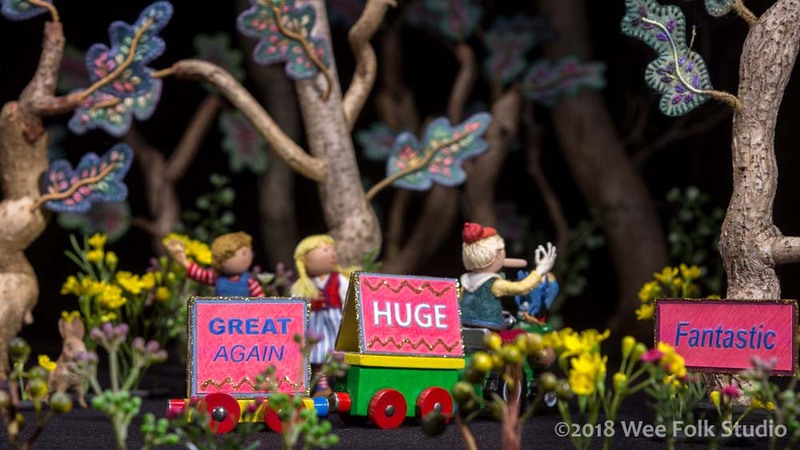 This entry was posted in American Art - post-election period, Animation, Liberty and Justice film, Photography, Video, Wee Folk Players (they're a stitch) by Salley Mavor. Bookmark the permalink. OMG!!! This is stupendous!!! I love the movie so much! All you work has paid off. This needs to be out there!! I am sharing!!!!! Congratulations! You did a wonderful job depicting how we got into this mess with politics in America. I hope we can still have a happy ending in our future. Love the Mike Pence character. I wonder what the sequel be??? Wonderful, a true labor of love! I hope your film is nominated for an Oscar. If there is not a category for it they need to create one for your film. Wonderful, just wonderful! Salley, the effort you and Rob put forth to make this film is so admirable. I’m in awe of how you have used your artistry to create such a potent commentary about the state of our country. Mike Pence made me laugh out loud, but then cringe. The use of the sheep to point out the racial and cultural divides is brilliant. Bravi to you both! Words can’t do it justice. Amazing! Beth said much of what I wanted to say. This is amazing! Good for you both. I hope this goes viral! You and Rob have done yourselves proud! Sorry Jacqueline, but we’ve decided to enter it into film festivals, so we had to remove the links to Vimeo and YouTube. It is still on this blog, though. Glad you are entering it in festivals. This film deserves a wide audience. It makes a point (and the dolls themselves and sets are amazing). Ah… I was going to suggest that you enter it. It’s amazing! 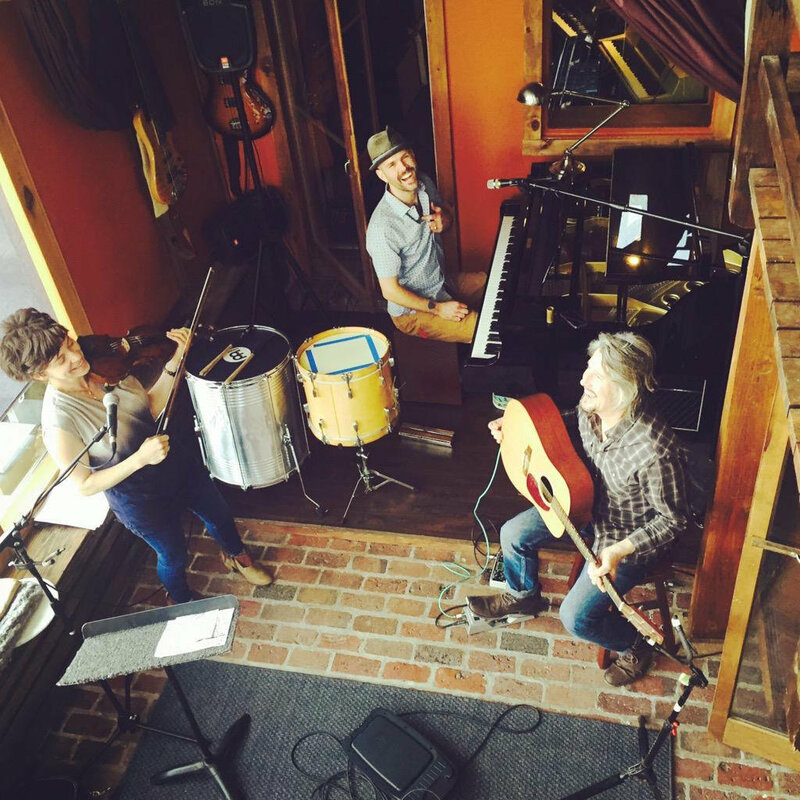 I can’t even begin to imagine what goes into something like this… What a team you two are! Your work, of course, is always exceptional, but how cool that your husband has the perfect skills to partner with you on this. Fantastic! I cannot watch the video on youtube, but your email suggests that it could be. Will that link be available later? Sorry Althea, but I had to remove the links because the movie has been submitted into film festivals. For now, it’s just available on this blog. You and Rob have created something that’s truly amazing!! The message comes through loud and clear — thank you. Watched your film. So much work and all conveyed sooo much. Loved Melania’s figure, her shoes and wiggling foot! Trump certainly looked like trump – with his cheap looking red hats I hate. Putin was fantastic!! And the costuming on trump as all the “rulers” were fabulous. I will watch again. Congratulations on a wonderful commentary. i agree! absolutely brilliant! such talent too. i’m in awe. I’d love to watch it but both Vimeo and YouTube said it was not available. Is anyone else having that problem? Sorry Judy, but we’ve decided to enter it into film festivals, so we had to remove the links to Vimeo and YouTube. It is viewable on this blog, though. 😆. if you ever have time (? ), ck out her previous political scenarios. 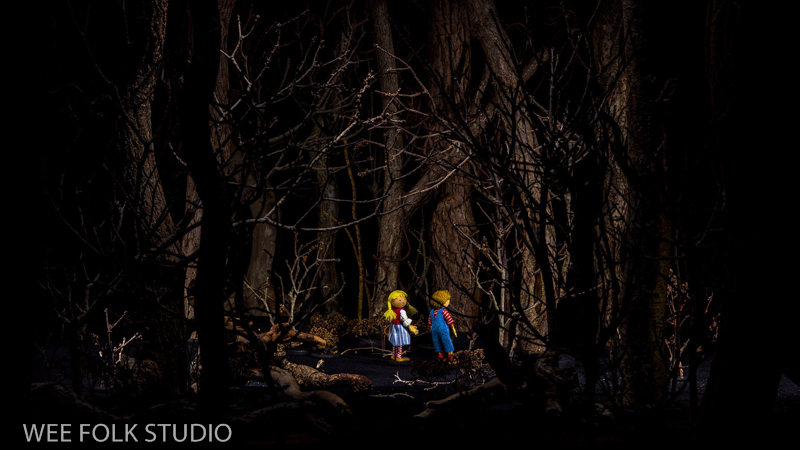 she did a whole bunch of vignettes, and the creation of the figures and the set ups are amazing. i saw the birds in person and it would blow you away. coming over soon? friday? Yes, there will be an audience at Film Festivals. Satire is so healthy and so needed. Even though you’ve been teasing us for ages with your work-in-progress photos, nothing could have prepared me for how magical the finished movie is. The animation takes the characters to a whole new level. Brilliant. Well worth all the hard work. Definitely going to watch this again and again. Wow, Salley and Rob, this is really astounding. 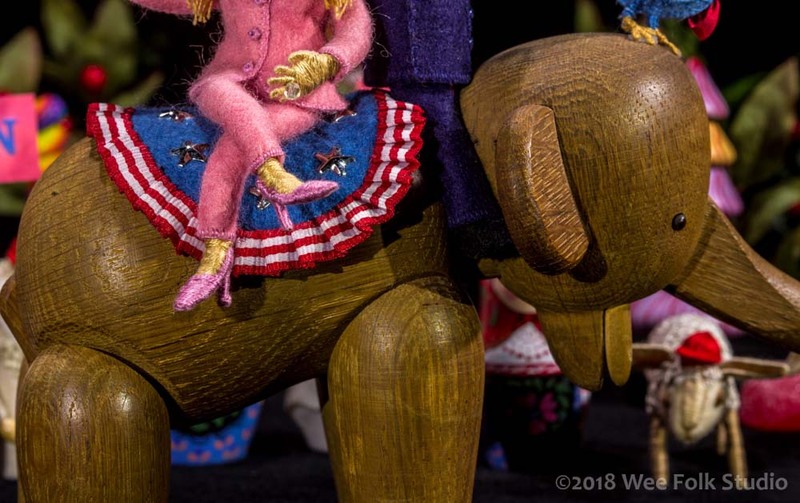 It is so beautiful to look at (I love moving through those forests), funny (that elephant scene with Pence and his bucket of sh*t), and so impressively skilled, as always (beautiful stitching, uncanny likenesses). And the soundtrack is perfect! I’m glad you will enter this in festivals so that it can reap the honors it deserves. Since you began this project I have been inspired by your urge to use your gifts to make a statement. What a labor of love. Thank you. Wow!! 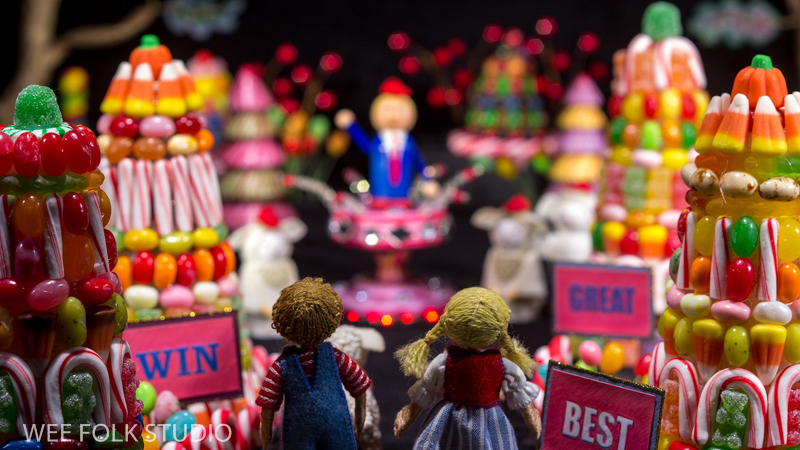 So many little touches–the Burma Shave sign; the sheep with the red hats; the Russian nesting dolls and the troll dolls–Just fabulous!! I hope you will submit this somewhere so you can get national recognition–Hollywood would love this!! Congratulations on you and your husband’s venture into film making. Do you seriously mean that I can circulate it on Facebook and in my Blog? If so, do you have some information you would like me to include. Thank you Ann, I’m glad you like it. Right now, the movie is set up to only be seen on this blog, within the context of my artwork. You may share a link to this post, if you like. Congratulations Sally and Rob on an amazing piece of art. From an outsider (British!) this really does depict the situation you find yourselves in over the pond. The costumes and animation are incredible. Your hard work has paid off. Good luck with the film festivals – if I were a judge you would win, hands down! Well done!. Ditto to all of the comments above. I must say, you have created an amazing piece of work! It was well worth the wait. We need to make the Academy of Motion Pictures aware of this superb stop-animation video. It is that good. It is great! Happy that you have submitted to the film festivals (plural?) 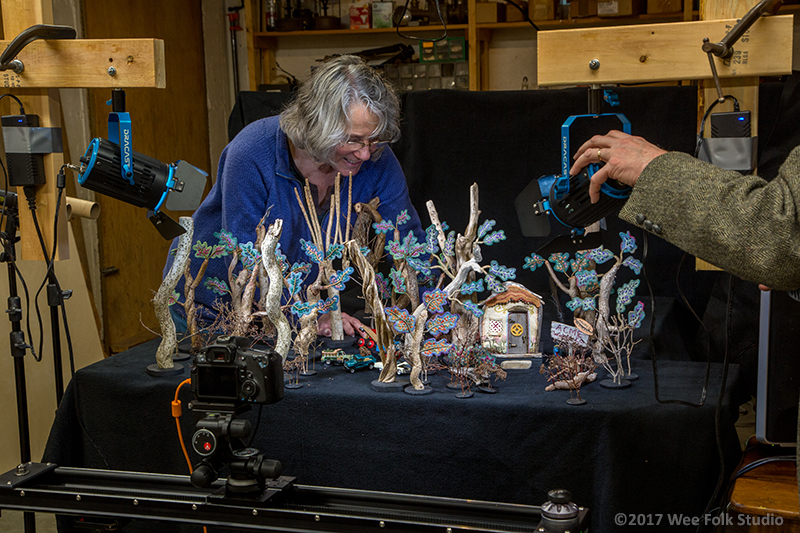 Someone will take notice of this amazing body of work, both in the film and stitch world. I’m going to pass it along to those who appreciate political satire along with stitching. You are simply amazing. Such a talent! Thank you for your kind words of support, Barbara. Through your comments over the years, I feel like I know you! Congratulations! You and your husband have managed to say mouthfuls in a short non verbal piece. Can’t imagine the time and patience put forth from beginning to end. It’s great. This is amazing! The end where he transforms into various dictators is chilling. So well done. Congratulations on your achievement! You folks put together something amazing. I showed it to my husband, who wasn’t familiar with your work, and he was blown away by both the medium and the message. 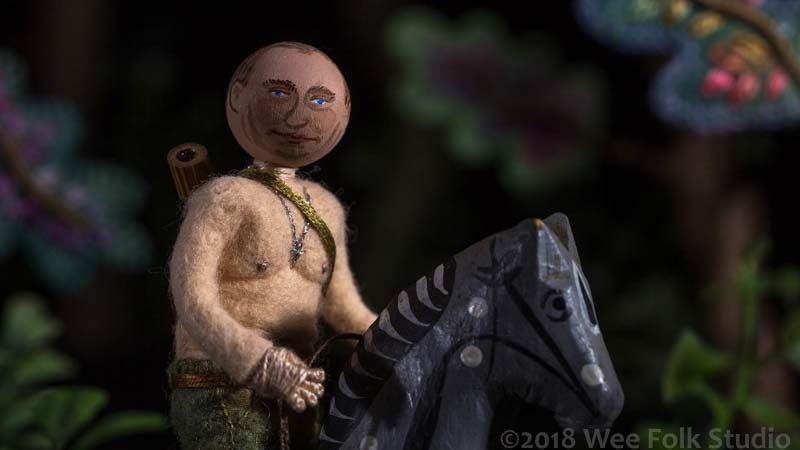 Apart from being wonderstruck by all the incredible work and thought that went into the film, I’m really caught by how irrelevant Bannon has become since you started the project, and how Putin looms large as ever. It just goes to show how mercurial the whole situation is. I’ve watched this multiple times now, each time admiring a different detail. I realized today that Stellwagen Symphonette did a terrific job of providing “evocative” music and sound effects. It all fits into the movie so seamlessly. It adds just the right touch of added dimension to the story without being overwhelming or distracting, as a good soundtrack should. Every detail of the movie was well thought out and rich with meaning. Enjoying it immensely. Thank you Mia, I’m so glad you’re taking the in the details. 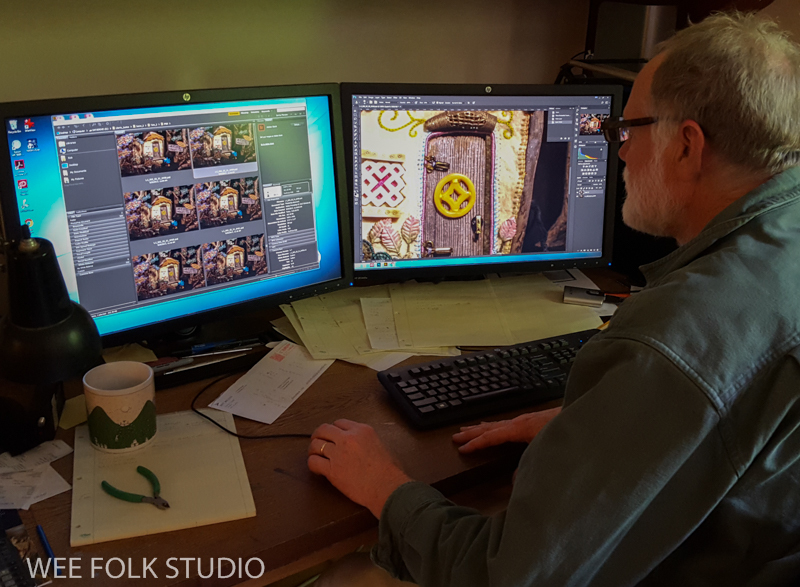 Yes, the music is an important part of production, as it is for all animation. Wowza!! 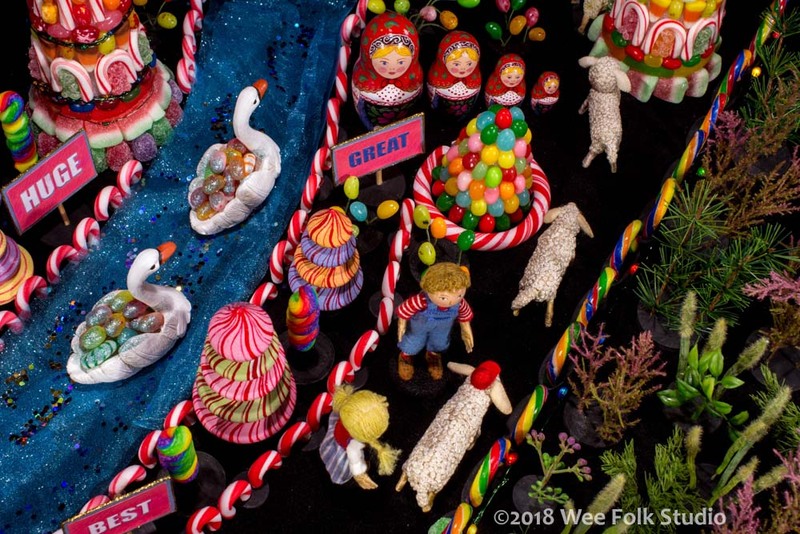 The detail in both your fiber art work – wee folks is outstanding! The lighting, filming & story is very creative & incredible! I’ve been following you for awhile Sally !!! This is truly an outstanding work of art & heart!! Just absolutely wonderful. Even with reading your posts and watching your progress, I am amazed at the amount of work and planning that went into this project. It’s fabulous. Thank you! respect for one another is a thing of the past, how unfortunate. Thank you for expressing your opinion, Theresa. I find it curious that you describe the movie as hateful. It tells the story of our time, as a cautionary tale with a warning not to be fooled by false promises. I certainly respect your judgement about what is appropriate and what is not for your grandchildren. Is the movie critical? Yes. Is is full of worry and concern for the future of our democracy? Yes. But hateful it is not. Amazing wondderful film.How can I show it in bigger format to a group.I saw it on pinterest on my phone but its got a big arrow in middle of screen. Thank you, Anya. For the time being, the movie is just available on my website. To see it larger, try hooking up a computer to a screen. After it is in film festivals, it’ll be put on Vimeo.